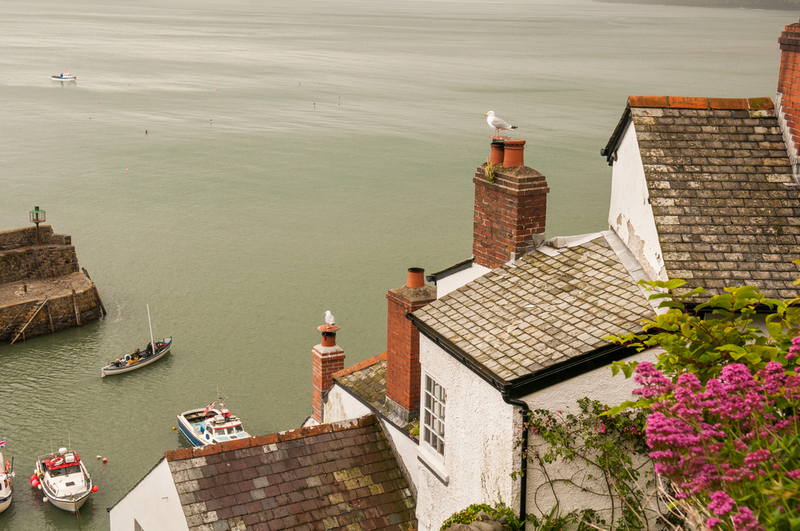 Cob houses overlooking the harbour in Devonshire. Say the words “tiny house” and it’s likely to conjure up images of a wood frame house on wheels that’s a total of 10 square metres inside, with a treacherous ladder leading to a loft bedroom where anyone over six feet tall is bound to bump their head. In actuality, tiny houses are as varied as the people living in them. They don’t all have to be mobile and they don’t all have to be made of wood. The unpainted wood interior of many of the American tiny houses is frankly – not everyone’s cup of tea. But have you ever considered a house made of cob? Cob, or clom as it is known in Wales, is a home typically made of clay and straw. It is an organic form of housing, and an important part of the history of architecture in the UK. They were particularly popular in Devon and many fine examples of them can be seen today. 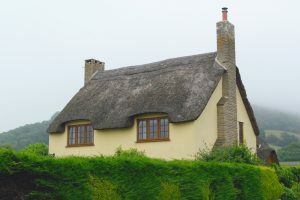 A lovely cob house near Axmouth in Devonshire. According to historic records, the word “cob” apparently came into common usage in the 1600s, though houses of earth had been in existence for centuries by that time. Though stone, brick and wood eventually displaced cob as a popular building material, it has enjoyed a resurgence since the 1990s. Its value as an inexpensive alternative to brick and wood, and the concern for greener living and sustainability, have increasingly focused more attention on cob in the last few decades. Some practical advantages, in addition to economic ones, are that is it resistant to earthquakes and fire. The thick walls also function as a natural insulator, keeping the home warm in the winter and cool in the summer. Besides practical advantages, cob offers a level of creativity that cannot be achieved with conventional building materials. Homes can be built to any shape with decorative flourishes and carvings. Many cob houses feature coloured bottles which have been placed in the walls for decoration and light. 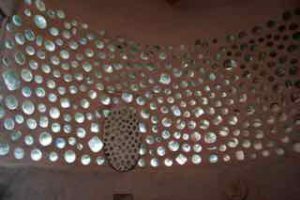 An example of recycled bottles used in a cob house to add light and decoration. Although houses made of earthen material can be any size, they are frequently used for small structures, and make a cozy place to call home. Though they require many hours of labour because they are built by hand, this also makes them a more reachable goal for many seeking to build their own home. There are many instructional videos on YouTube, showing how to begin, as well as classes available to give actual hands on experience in working with cob. Professional cob builders are also available in the UK. For a good overview of the entire process, and a documentary on a cob building class, visit our library page, for video links. 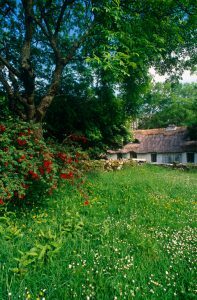 A beautiful old traditional cob house in Northern Ireland.